Recently, Mr Dunston (of the “Dunston Checks In” fame) came to the EDRi Brussels office looking for help. He complained that somebody from the European Parliament is messing up with his “holy banana collection” that he has been preserving since decades after he inherited it from his forefathers. Other than that we had no information. Being the defenders of human rights in the digital environment, we decided to help Mr Dunston. Coincidentally, we were working on a project called ALTwitter, where we had created Twitter-like profiles of the Members of the European Parliament (MEPs) based on their metadata. We thought, for once, let’s use metadata for social good. We collected approximately 10000 publicly available tweets from the Twitter accounts of 617 MEPs. We stripped the metadata associated with these tweets – such as source of the tweet i.e. the device or service from which the tweet originated – for further analysis. We counted the number of times each of those devices or services were used by MEPs. Then we arranged them according to how frequently they had been used. We then selected the few least commonly used devices or services. This was to find the sources which are used only by a few MEPs. We were surprised to see “Banana Kong” as one of the rarely used sources of tweets from MEPs. Apparently, it was used by only one MEP on her Apple (iOS) phone. That was none other than Angelika Niebler. Because we had seen this information in Ms Niebler’s metadata, we searched her chronology to see if she had ever mentioned her surprising pastime. Sure enough, evidence of Ms Niebler’s banana enthusiasm came to light. Angelika has been stealing Mr Dunston’s bananas since August 2013, and she owes him compensation – big-time. We would never have found this proof, if metadata hadn’t pointed us in the right direction. This is the same metadata the advertisers are using to target her with more personalised ads, track her online activities, and undermine her privacy online, and possibly offline. And our privacy, too. 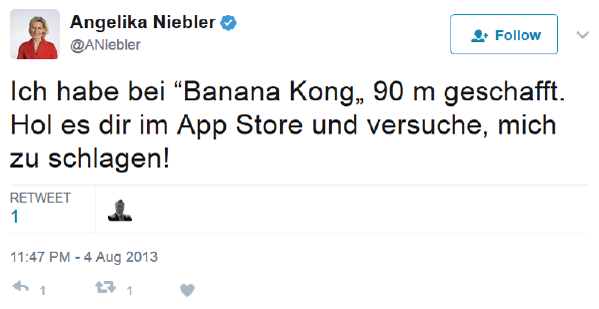 When signing up to use the app, Ms Niebler agreed, as a prominent Member of the European Parliament, to share a variety of personal information, including her device identifier, geo-location information and IP address data with the game supplier and fourteen other companies, mainly based in the United States. We believe that his demands are fair. If you agree, join us on our mission to defend everyone’s digital rights! We want to convince Ms Niebler and other MEPs to vote right on the e-Privacy Regulation, to make sure it guarantees privacy by design and by default for our online communications. We want to make sure that no one can be refused to access information because they oppose being tracked (no “tracking walls”), that groups can act on behalf of citizens when an infringement has occurred and that tracking can never be the default. Find out more about e-Privacy here!